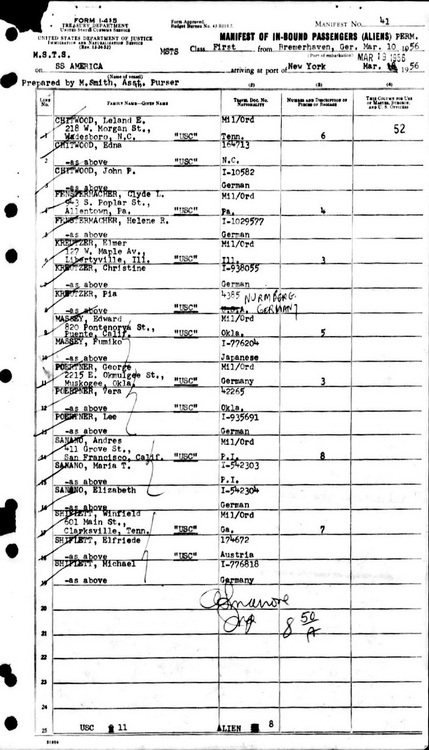 Leland, along wife wife and son, are listed aboard the SS America with wife Edna and son John (lines 1, 2 and 3). The ship departed Bremerhaven, Germany 10 March 1956 and arrived in New York City harbor 9 days later. It is presumed that Leland had remained in the Army. 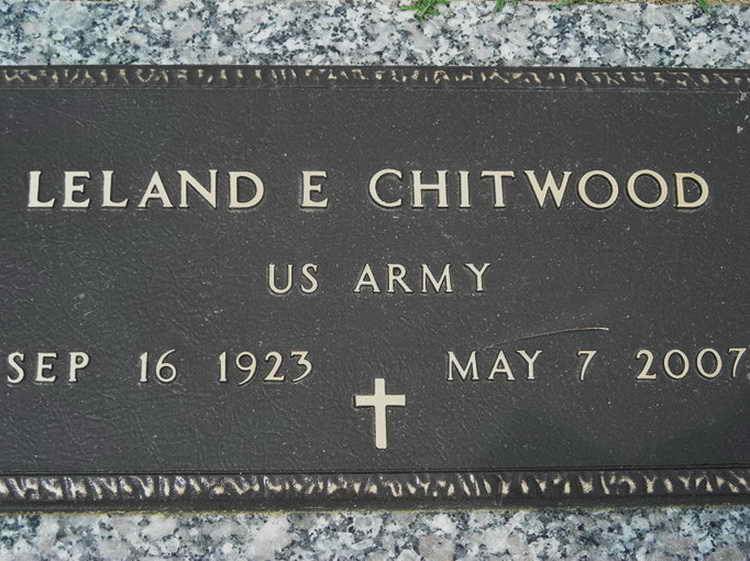 Grave marker for Leland E. Chitwood in the Lafayette Memorial Park Fayetteville (Cumberland county), North Carolina. Leland enlisted at Ft McPherson, Atlanta, GA on 15 August 1940. Initially serving in the Field Artillery, he transferred to Airborne and after completion of jump school he was assigned to the Hq Company, 1st Bn, 508th. Pfc Chitwood received the CIB and Bronze Service Arrowhead device for action during Normandy, France Campaign, 6 June 1944 to 9 July 1944. Cpl Chitwood participated in the Operation Market campaign in Holland. On 15 June 1946 Sgt Chitwood was awarded the French Croix de Guerre with Bronze Star for "exceptional wartime services during operations in the Liberation of France". MSgt Chitwood appeared in a Stars and Stripes photo along with Lt. Rome Stephens. Both were on reviewing stand representing the 82nd Airborne when Gen Ridgeway left Europe.